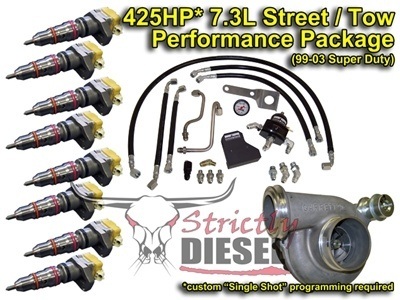 425hp Street / Tow PackageThis performance package is geared toward providing a middle ground between "entry level" and "competition level" upgrades, a truely streetable performance package that can still easily tow your trailer when the chip is turned down. 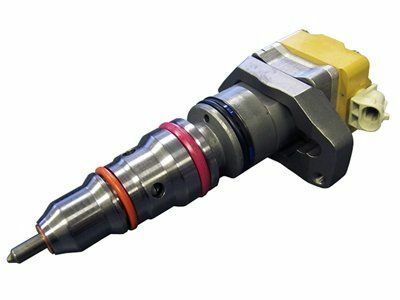 These 200cc single shot injectors are 60cc larger than stock and have repeatedly produced up to 425hp (using 30% over stock nozzles) with the proper Custom Programming (not included...see note below). Also included is a Driven Diesel Regulated Return fuel system kit, which will ensure that the injectors are receiving the proper volume of fuel, at the proper pressure, at all times. That last piece of this package is a Garrett GTP38R Dual Ball Bearing Turbocharger. The 38R turbocharger has proven itself to be an excellent performer with great durability, and it matches very nicely with these injectors. INJECTOR NOZZLE SELECTION NOTE: The "30% Over Stock" nozzle is the standard size for this injector, and the recommended size for any 2001-2003 truck with "Powdered Metal" Connecting Rods (PMRs). 80%, 100% and 200% over stock nozzles are also available, for the same price. We recommend staying with smaller nozzles when significant towing is planned. 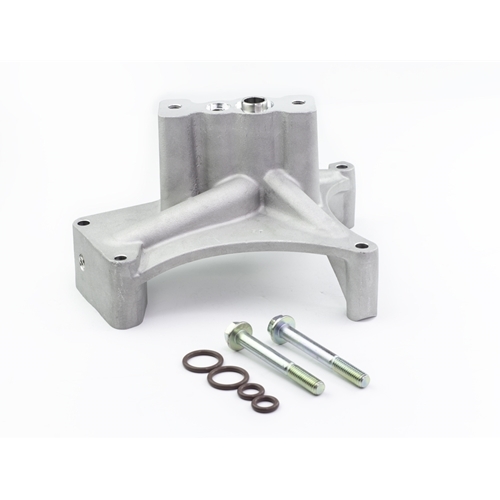 Larger nozzles will make more HP and Torque at lower engine RPM, and if programmed or driven incorrectly, can lead to significant engine damage. The larger the nozzle, the more low boost smoke and exhaust temperature increase can be expected as well. Make sure your tuner knows exactly which size nozzles you have when they write the programming for your truck! FUEL SYSTEM NOTE: 200+cc injectors coupled with any aggressive tuning and a factory fuel pump/system WILL result in fuel pressure drop problems. 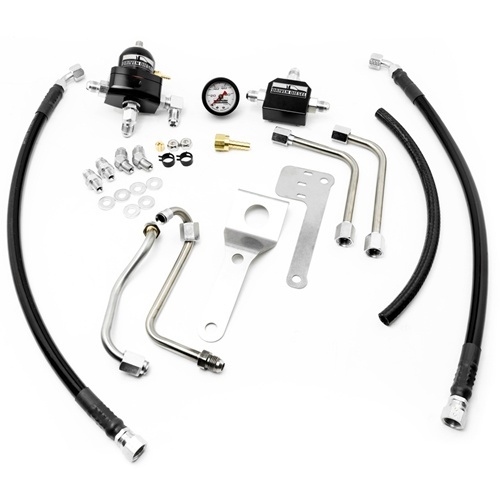 As such, we have configured this package with ONLY our FUEL BOWL DELETE Regulated Return kit, and anticipate that most customers will be using upgraded fuel pump/filter setups. 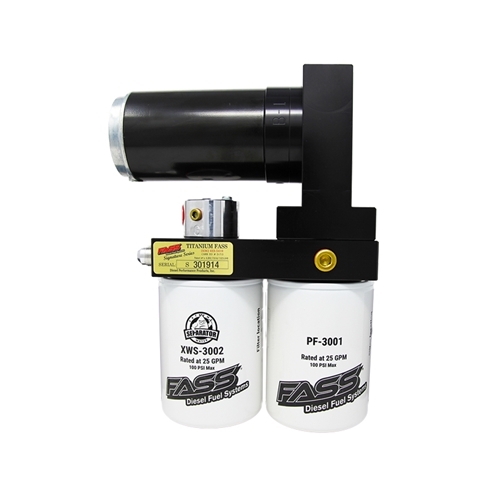 We highly recommend the use of either a DRIVEN DIESEL RACE FUEL SUPPLY KIT or the FASS Titanium Series 125gph pump, Driven Diesel 75psi FASS Spring and Driven Diesel FASS Install Kit with this package. If you choose to do your own fuel pump and filter setup, you MUST use a 2micron POST FUEL PUMP fuel filter to protect the fuel injectors! CUSTOM PROGRAMMING NOTE: "Off the shelf" programmers, and "generic" chips will not work properly with these injectors. Custom Programming is REQUIRED to properly operate these "Single Shot" fuel injectors. We did not include the tuning as part of the package because of the number of different options (both hardware and program selection). If you are not already working with someone to do your Custom Programming, please check out the DP-Tuner F6 chip in the CHIPS AND PROGRAMMERS category on our website. These "Single Shot" injectors will require the CUSTOM programming offered on that page. HIGH PRESSURE OIL SYSTEM NOTE: The injectors in this package are HYBRIDS. Hybrid injectors use significantly less engine oil per injection event when compared to standard A-Code injectors. Assuming a properly working high pressure oil pump, high pressure oil system upgrades should not be needed with these injectors. For additional information about any of the products in this package, click the appropriate link in the "Related Products" section at the bottom of this page. Also in the "Related Products" section at the bottom of the page are some other common upgrades or add-ons that go nicely with the products in this package. The injectors in this package are fully rebuilt, include Brand New Nozzle Assemblies and Internal and External O-rings, and come with a 5 year / 200,000 Mile Warranty. The Swamps Diesel injector core policy requires that the same number of injectors be returned as were originally purchased. Cores MUST be returned following the Swamps Diesel shipping guidelines. Injector cores with broken nozzles or electrical solenoids due to not following proper shipping procedures will not be accepted as cores. Injectors with signs of damage from water or veggie oil use will not be accepted as cores. Core refunds will not be given until the cores have been received and inspected by Swamps Diesel. This performance package is geared toward providing a middle ground between "entry level" and "competition level" upgrades, a truely streetable performance package that can still easily tow your trailer when the chip is turned down. These 200cc single shot injectors are 60cc larger than stock and have repeatedly produced up to 425hp (using 30% over stock nozzles) with the proper Custom Programming (not included...see note below). Also included is a Driven Diesel Regulated Return fuel system kit, which will ensure that the injectors are receiving the proper volume of fuel, at the proper pressure, at all times. That last piece of this package is a Garrett GTP38R Dual Ball Bearing Turbocharger. The 38R turbocharger has proven itself to be an excellent performer with great durability, and it matches very nicely with these injectors. NOTE: A refundable core charge of $1200.00 will be automatically added when purchasing this product.